Firstly, footwear, when we went into the sea or by the slippery pool, I wanted to make sure that we had sensible poolside footwear. I have worn flip flops before and they get slippery on the poolside, So these Womens Zanpa Pool Shoes were perfect for me and in fact, I wore them for most of the time that I was in Turkey because they were so comfortable and under long dresses, they couldn't even be seen! You can find the full review on my swim shoes as well as a pair that was sent through for Tilly here. 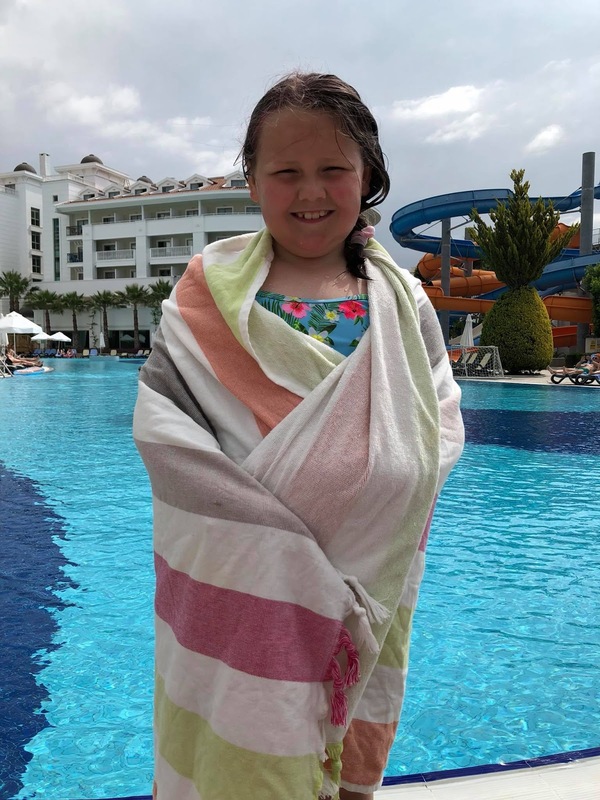 Tilly was an absolute none swimmer when we first went to Turkey, She was scared of the water and she also was scared if the water splashed her face. 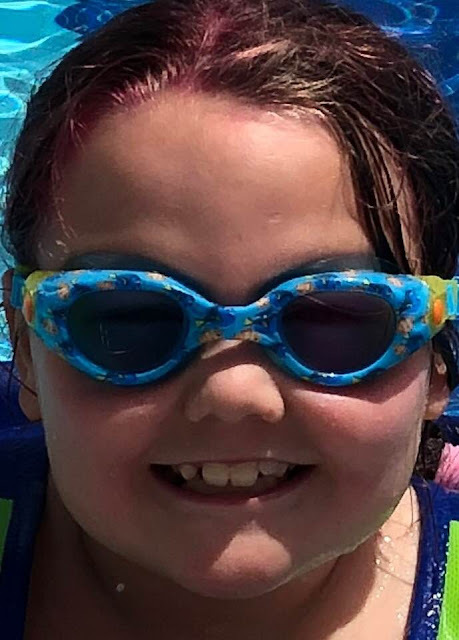 So we reviewed some Zoggs Dory and Nemo goggles, these were fun for her to wear and she felt more confident going in the water. We have written a review of them here and they only cost £4.80. They were a great fit and kept the water out of her eyes. For a swimming costume, I normally stick to dull, dark colours because I am a size 26, So I want to kind of disguise my body. But you know what? I am a size 26 but that's who I am so I wanted to be able to make a statement by the poolside this year. I wanted to have people looking and saying that my swimming costume looked good. So I chose This draped twist front swimsuit in Grape colour. 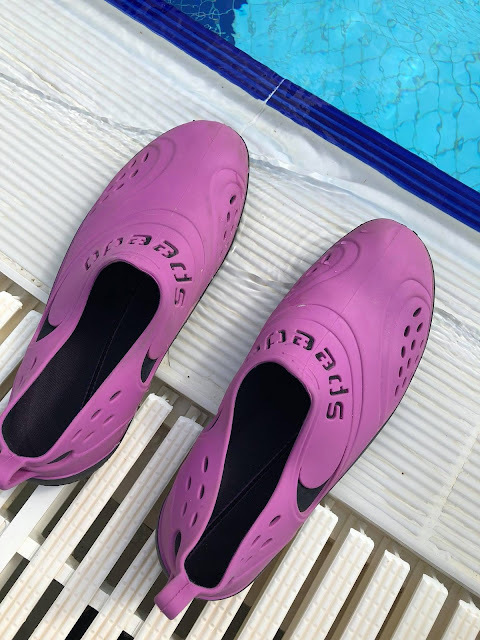 I love the pink colour of it and it will certainly make me be seen at the pool. It fits well and I love it. The swimming suit looks great with the Summer Solids Beach Sarong in pink ombre. 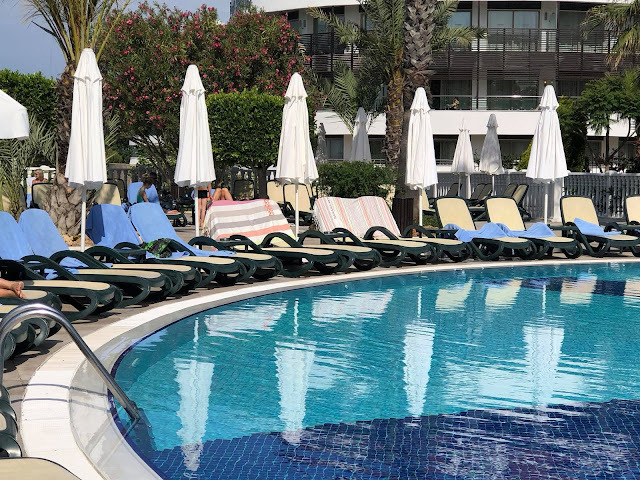 I actually lived in the sarong and swimming costume for most of the week. The sarong can be worn from the pink at the top of white at the top. This gives the sarong a different look when you are wearing it either way. It costs £35.40. The towels are from the California Banana Moon range and they are fantastic. Most hotels supply towels, but we always take our own and we really stuck out with these. They remind me of a seaside design anyway and they are so soft to use. I am definitely keeping these for my beach trips. They cost £28.00 each and when you think you can buy a cheap towel with a tacky picture on it for the same amount, you get quality, fun and comfort, all in these towels. The products from Simply Beach and Simply Swim are fantastic quality and I would buy from them again. Want more beachwear ideas? Pop over to Just Average Jen to see her bucket list of bikinis.